Swallowing deeply as I took yet another sip of coffee, the early morning mist was beginning to clear and I found myself peeking out the front door. Spotting the movement in the distance, I just had to get the doe and her fawn (now without spots). Munching the neighbors weeds (which is also where I've seen the baby rabbits hide), they seemed content as I watched them wander down the gravel road to our woods below the house. Although it's hard to believe summer is officially over. If i had that view i would do nothing but stare out the door or a window. wow on your view..
What a wondrous thing to see through your front door...and yes...happy Labour Day to you to. Happy Labor Day! Very neat shots. I love looking through this window! What pretty view you have. We got to peek through the door with you! I always enjoy other bloggers sharing deer, not so sure I'd be happy with them in our yard though. I think it's so special that you can spot deer through your front door like that. 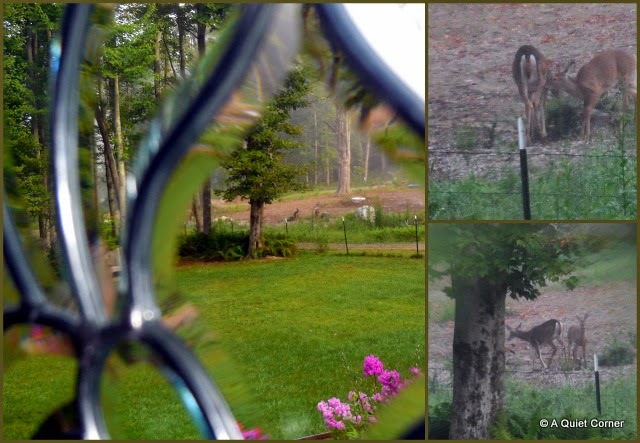 Lovely shots of the deer especially through the glass of your front door. Fun seeing the deer. We have so many bunnies around this year. What a treat! They hide in our forsythia bush.